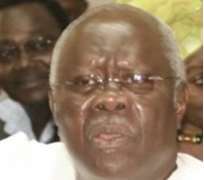 According to huhuonline.com checks, troubles started for Bode George when former President Olusegun Obasanjo, who claimed to make anti corruption war the corner stone of his government, was angry over the report of a committee set up to probe NPA contracts, submitted by former Minister of Transport, Abiye Sekibo. While the report indicated that Board and Management of NPA, have failed to pin point who did what, when and how? Obasanjo, therefore set up another review panel, headed by Engineer Mustapha Bukar from the office of the Head of Service of the federation that time. Other members were Mr.Greg Ogbeifun of Starz Investment Company, Mr. A.A. Lawal of Tata Industries, Kano, Chief John Amadi Damshakai of the office Plateau State governor, Barrister (Mrs.) Nella Andem Ewa, a Calabar-based lawyer, Mrs. B. F Oyelowo of the Auditor-General of the Federation's office, Abuja and Mrs. G.O Ezezika of the Ministry of Transport, Abuja. Obasanjo mandated the committee to review all contracts awarded at NPA between 2001 and 2003 and determine exactly how much was expended, with dates, exactly how much was paid out on each contract, the outstanding amounts and works not executed but for which monies were paid. Bukar and his men were also asked to find out whether the board followed correct procedures in the award of the projects. When the committee submitted its reports, it unearthed a rotten can of worms. Bukar revealed that George's board awarded 29,586 contracts, valued a N85 billion. Worse still, if the contracts were not split, the committee revealed that they could not be more than 300, all of which were abandoned and massively inflated by Bode George and his men. As exposed in Court by EFCC, Bukar found out that the NPA board split contracts so that each of could fall within the limit of or value that is permitted for an office or echelon. The Bukar committee found out that contracts were awarded to companies which, on the surface, belonged to a few. For instance, about 80 percent of the nearly 30,000 contracts awarded within the three year period actually remained within about 135 companies owned by a handful of people. An example of a split contract, according to the panel was the one awarded to Hesta Industrial and Marine Engineering on 30 January 2001 for 171,596 and 169,290 Deutschemarks. It was discovered that 190 contracts were awarded for the supply of 66 items. George and his men purchased N90 million Muntzingots and N95 million aluminum electrodes, items which NPA did not actually need during those periods. In the purchases, George was said to have disregarded official price list, a practice which led to over-in-voicing. ''In one case,'' a battery that ordinarily sold for N4,000 was awarded to a contractor for N16,000 each. Apart from that the supply of five drums of lubricant was awarded to Ckipper Marine Limited on 26 June 2003, at a whooping sum of 60,752 Euros. Again 29th of April the board awarded a contract for the supply of 628 pairs of safety boots to Messrs Map Telecommunication for 69,708 Dollars. In all these, the board exhibited total disregard for budgetary provisions and budget implementation. There were also cases where maintenance contracts were awarded for non-serviceable-plants; an example was a plant being serviced by Forhr and Co and New Ventures. Also many capital projects had been commenced and funded by contractors on lopsided terms with amortized payments from NPA's pilotage dues and royalties. No due diligence was said to have been really done before the Authority was plunged into such commitments. After all, this Obasanjo set upyet another panel, headed by Ribadu. Other members of the committee were U.J. Shuwa of the Federal Ministry of Transport, M.A. Bello from the office of the Secretary to the federal Government; J.O. Omotosho, representing the Ministry of Finance; Buba Gamawa, who works with the Head of the Civil Service and Y.A. Olaleye of the Budget Monitoring and price Intelligence Unit. Mrs. G.O. Ezekika of the Federal Ministry of Transport was the Committee's Secretary. The Ribadu committee was however asked to conduct an indepth investigation on all the contracts awarded by NPA from 2001 to 2003, and examine all outstanding bills from its creditors to ascertain whether or not such contracts were awarded in accordance with government rules and regulations the governing the award of contracts; and identify the culprits and apportion blames as applicable. The committee visited some of the locations for physical verification, stores to confirm the delivery and physical existence of the items supplied, or evidence of their utilization. The committee was able to establish appropriate prices for the contracts, including those awarded by the board, the management committee, Managing Directors and Executive Directors. To ascertain how NPA was fleeced in the area of supply contracts, the committee conducted market surveys on the prices of goods and equipment supplied to the NPA during the period. This was in addition to the exercise conducted earlier for the Bukar committee by J.K. Randle and Co, an accounting firm. It showed that goods worth only N200,000 per unit were awarded to contractors for N7million. Another shock was that a baton was given three different names and awarded severally at high rates. The rot to be cleared by Ribadu was much and his men begged for an extension of their assignment from six to 11 months. According to Ribadu report, the NPA is regarded as one of the parastatals where irregularities and malpractices have become deeply entrenched. It said that the authority is plagued with massive corruption and inefficiency, especially in the award of contracts. When finally submitted his findings to Obasanjo on Tuesday 21 February 2006, Ribadu lamented saying the board and management of NPA, during the period under review, are responsible for the flagrant violation of the extant government rules and regulations on award of contracts. He further pointed that submission confirmed the board and management's financial recklessness, disregard for due process guidelines, gross and massive inflation of contract prices and excessive contract splitting. Although George claimed that his position was just ceremonial and did not place him in any situation to award contracts, Ribadu revealed that the NPA board under Bode George and its management conferred upon themselves various approval limits, in clear violation of the Federal Government rules and regulations guiding the award of contracts. Others are the Executive Management Director, Executive Directors General Managers and Port Managers, each with its approval limit. The board alone, as the Ribadu committee maintained, awarded contracts with a total value of N 9.3 billion, 213.6 million Dollars, 9.6 millions pounds, 204,395 Euros and 56,220.00 Deutschemarks. Engineer Akagwu, acting Managing Director of the NPA between November 2001 and April 2002, awarded contracts totaling N1.6 billion, 1.9 million Dollars, 349,432,110,556 Euros and 545,607 Deutchmarks, Architect Aminu Dabo, Managing Director of Authority between May 2002 and October 2003, awarded contracts worth N17 billion, N13.77 million Dollars, 4.84 million pounds and 569,411 Euros. Ribadu further revealed that prices were so arbitrarily fixed, as if such critical exercise is not governed by any principle whatsoever, but solely the discretion of the approving officers. In confirmation of the contract splitting tactic of the NPA board, the Ribadu committee confirmed a particular case where contracts for 11 air Taser cartridges were bought by its security department, on 10 March 2003, for about N9.8 million. If proper procedure had been adopted, the special committee pointed out, the contract should have gone to the federal Executive Council. Another contract of N900 million which the the committee found out was split into 100 units and awarded to 2 contractors at 50 contracts each. On 9 August, 2003, 12 contracts were done the same way, as they were irregularly awarded to 12 different companies for the supply of Mitsubishi Double Cabin Patrol Vans, each at a cost of N8.9 million, the committee revealed. The report showed that the contracts awarded by NPA was in foreign exchange, and it was deliberately awarded to siphon the foreign earnings of the Authority as there was no justification whatsoever to award such contracts in foreign currencies as the items are available locally. Contract of significant values were, as the committee revealed entered into without contract agreements, thus ignoring the need to safeguard te integrity of contracts of substantial values. The special committee recommended that all contracts approving authorities in NPA, including the board and Management of NPA, Managing Director, other categories of approving authorities, as well as the appraising officers who served during the period under review should be held responsible for deliberate and flagrant violations of extant government rules and regulations governing the award of contracts. The special committee also declared that board and management of NPA and the entire contract approving authorities of the Authority, as a well as appraisal officers, during the period under review should be appropriately sanctioned for contract splitting and inflation of contract prize in utter disregard of laid down government rules and regulations. Huhuonline.com gathered that the erstwhile president Olusegun Obasanjo was so surprised at the enormity of the graft perpetuated by his friend and political associate, Bode George that he swore never to let the matter lie low. Consequently, huhuonline.com gathered that there were also pressures from rival Action Congress (AC) who were bent on seeing how PDP, to which Bode George belongs, will pursue and prosecute the case. Top guns within the party were said to have threatened to expose any attempt to exonerate the former NPA Board Chairman in light of the overwhelming evidence against him. The PDP got the message and subsequently let the law take its normal course, the outcome of which is the jail sentence. Before then, series of attempts were made to President Yar'Adua to intervene but he was said to have warned all those who came to him, to steer clear. He simply left Bode George to bear his burden. However, that decision by the immediate past President was the catalyst for George's unfolding and current travails. But some have also argued that the verdict slammed on Bode George was 'a slap on the wrist' and that the judgments should have made George to stay longer than the stipulated 2 and half years in Prisons, as well as advising him to make a refund all his looted funds while he was the NPA Board Chairman.